Goodreads Summary: Debut novelist Kiki Hamilton takes readers from the gritty slums and glittering ballrooms of Victorian London to the beguiling but menacing Otherworld of the Fey in this spellbinding tale of romance, suspense, and danger. The year is 1871, and Tiki has been making a home for herself and her family of orphans in a deserted hideaway adjoining Charing Cross Station in central London. Their only means of survival is by picking pockets. One December night, Tiki steals a ring, and sets off a chain of events that could lead to all-out war with the Fey. For the ring belongs to Queen Victoria, and it binds the rulers of England and the realm of Faerie to peace. With the ring missing, a rebel group of faeries hopes to break the treaty with dark magic and blood - Tiki’s blood. Unbeknownst to Tiki, she is being watched - and protected - by Rieker, a fellow thief who suspects she is involved in the disappearance of the ring. Rieker has secrets of his own, and Tiki is not all that she appears to be. Her very existence haunts Prince Leopold, the Queen’s son, who is driven to know more about the mysterious mark that encircles her wrist. The Faerie Ring is historical YA fiction with a fantastic setting and exciting paranormal elements and since this is all stuff that I adore, I have no idea why it took me so long to read this book! Kiki Hamilton does an excellent job of transporting the reader to the dirty, poverty stricken streets of London and the opulence of Victorian Buckingham Palace. He world building is awesome and my favorite aspect of this book which is saying a lot because the plot of The Faerie Ring is really good too. Tiki is an interesting character, one that took me a few chapters to get warmed up to. Tiki and her band of orphans are thieves and not the Robin Hood sort who steal only from the rich. They steal what they need from anybody, rich or poor and are completely unremorseful about it. It just didn’t sit well with me at first but as I continued to read, I realized just how little options these children and teens had. It was either go into an orphanage and be forced into back-breaking child labor, prostitution or stealing. Under these circumstances, I would have become a thief too. The abject poverty and desperation these kids are in very well described and so when Kiki steals the ring, you understand her motivations behind her actions. At 16, Kiki is the mother figure for the group of orphans and she takes care of them through any means necessary. While providing for her ‘family,’ Tiki keeps running into another thief, the handsome and enigmatic Rieker. Rieker always seems to show up when Kiki needs help and becomes her protector, but who is he really and what are his motivations? Hamilton’s smooth writing kept me guessing about Rieker throughout the entire book. Secondary characters in the book are also very well done. The fey are appropriately vicious and I love how Hamilton weaves real people from history like Princes Leopold and Arthur into the story. 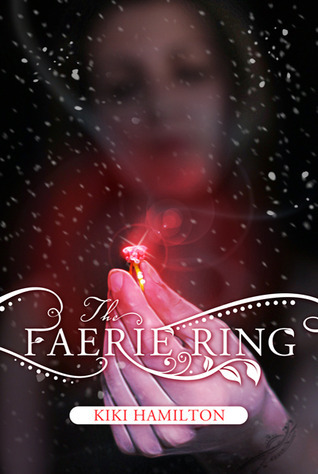 The Faerie Ring is an exciting, sweet and satisfying book and best of all, no cliffhanger! I loved the end and cannot wait to read the next book in the series. I highly recommend this to anyone who loves historical, fantasy or sweet love stories. If you have not read this book yet, do it! It’s definitely worth your time. When the sequel, The Torn Wing, is released in October, I will be reading it right away. I'm glad you enjoyed it NC! Loved this so much! Glad you enjoyed it! I'm going to have to read this book now. It sounds good. Thanks for introducing me to it! Good review. I haven't read this one yet. I loved this book too. I can't wait to read the next one. :) Great review.